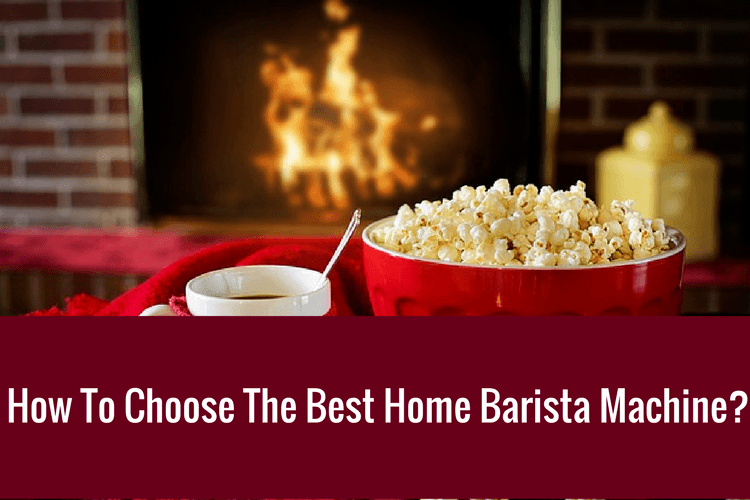 [GUIDE 2019] How To Choose The Best Home Barista Machine? Coffee has definitely proved itself to be one of the most popular drinks around the world with hundreds of billions of cups being devoured every year. Nearly all coffee aficionados according to the ​Scientific American journal believe that the classic brewed espresso is the “divinity in coffee." It is true that espresso with its distinctive preparation method brings out and showcases the flavours of the beans. If you are on the hunt for the perfect espresso and want to reproduce that café quality at home, giving consideration to a domestic espresso machine is a great idea. Why Should I Get a Domestic Espresso Machine? If you consuming large amounts of espresso-style drinks at cafés and marvel at the barista skills. Then you will find that getting an espresso machine for your home will pay off in the long run. Not only that, but you will have the flexibility to brew yourself a delicious sweet cup whenever you so desire. For those whom are considering to be a barista or aiming to open your own little cafe. Having an espresso machine at home is a big plus. You get to practice with your skills or simply trying out new blends for your shop. I have known someone who does it this way for a year or two before he deemed himself worthy of opening a cafe. What To Consider Before Purchasing? There are a few things to think about before you jump in and order your new espresso maker, especially if you are new. First of all, I would seriously consider an Italian brand. Not only because espresso originated in Italy but the Italians know what there doing when it comes to the coffee department. Secondly, what are you using it for? There are so many different kinds of espresso machines that suits various reason. Semi-automatic machines require you to grind the coffee yourself and compact it into the portafilter. Fully automatic espresso machines will grind the beans for you; all you need to do is dump in your desired amount of coffee beans. Some machines take pods so if you don’t want to deal with coffee beans at all you can just pop your pod in the machine. Like what we have mentioned, if you are looking for a cheaper alternative minus the hassle in the long-run. Get the super-automatic machine. If you are aiming to pick up a skill - get the semi-automatic. If you are not that picky about taste and just wanted a quick fix in the morning (or afternoon), get the capsule machine. Lastly, if you want to get a half decent machine you might have to spend more than just what your average Keurig will cost you. For example, one such consideration is that you might be purchasing a separate grinder if you are going for the semi-automatic machine. Usually, a suitable espresso machine for home would prioritise ease of use above all else. Good tasting brews are a given so I will not digress on it. Why? Personally, I would want my home barista machine to be value for money. And that means giving me consistently good brews while simple enough to learn the ropes of making a drink myself. And also to pave the way for a cafe soon. After that, I would consider the variety of drinks it can make. Does it have a frothing wand? And if I could get replacement parts easily? how is the after-sales service? If you are particular about milk-based coffee drinks like cappuccino, if is very important to get one with a good quality wand that makes actual froth (not bubbles). I said a lot, but nothing helps you even better by actually giving you some real recommendations. First one on the list is the sleek power-packed semi-automatic Breville BES870XL Barista Express. This machine is suitable for people who wants to be more hands-on. Probably barista-in-training. This semi-automatic brewer comes with everything that you will need, tamper, frothing wand and its own bean hopper and grinder. The built-in burr grinder allows you to adjust the grind size and dose. After-which, it will place the grind directly on the portafilter. It is easy to clean the machine as it comes with removable drip tray In addition, the machine will tell you when it needs a good cleaning (comes with cleaning kit) which is really helpful. Don’t let the number of buttons scare you. It looks daunting, but after some time, it is quite simple to navigate. The user manual is able to explain how to use it in good details. This might be a plus for some. This machine comes in black, stainless steel or red. So you might find it easier to match one for your kitchen or wherever you want to place it. As a mark of good service, Breville provides you with a one year warranty encase anything goes wrong. The DeLonghi Magnifica is a super automatic with a external steaming / frothing wand. You can use it to steam milk without frothing it. To set itself apart from the competitors. This unit has a patented “beans to brew” system that grinds beans before it brews to give the freshest cup. The burr grinder comes with adjustable settings for you to get the ideal type of grinds needed for your drink. If you wishes to use another type of grounds even when there are still beans in the grinder, you can do it as well using the funnel at the top of the machine. This machine also boast of an instant reheat function which means you don’t have to wait in between brews and can you make different drinks one after another successively. The patented "Cappuccino System" frother is touted to make one of the better milk froth out there. The wand is attached externally to the machine. Though, you would have to get your own metal container to contain the milk. Cleaning of the machine is made easier when you can remove the boilers from the machine. This makes places that are traditionally hard to clean easier. Another feature that you might not think you need but is actually helpful is the adjustable spigot. This allows you to use cups of various sizes, from small to those bigger than usual. Another super automatic. This time by Gaggia. The intuitive LED display makes making your next cup of coffee real simple. Another great brew with a couple of pushes. This espresso machine has its own patented advanced rapid steam technology which enables the machine to heat up very quickly. This makes sure that it is able to make successive brews. This machine used to come with a Mavea filter but it does not offer that anymore. So do take note if you were looking at this in the past. The built in conical burr grinder takes in your favourite beans. At the same time, there is a bypass doser which allows you to put fresh ground as and when. With its removable brew group, water reservoir and dreg box, this makes cleaning quite simple. In addition, it is also advisable to also clean the frother regularly. This espresso machine comes built in stainless steel makes it rather durable. We just wanted to mix in a capsule machine into the fray. This is for those that prioritize convenience. As you might be aware, Nespresso is a rather popular brand for these capsule coffee machine. The Pixie is what we will recommend. This machine is small and would be a great fit for those size-constrained. Of course, that would mean that the water reservoir would be small as well. This is why the empty water tank alert is really helpful or attempt to mitigate the shortcoming. Running out of water midway brewing will waste the capsule and makes less than ideal coffee. Their one-touch buttons that are programmable so you can set it to brew whenever you want. If you have a small cup, the foldable drip tray will come in helpful to make sure your drink won’t spill. For faster drinks, the quick brewing system reaches the perfect temperature and brews your favorite drink in about 25-30 seconds. The machine also comes with an automatic power-off function so it doesn’t consume extra energy when you are not using it. This highly functional machine also includes a starter kit of 16 different capsules with different aromas that you can try. The Delonghi ECAM45760B Super Automatic is considered to be on the higher end for prices. Although, this price tag is justifiable with its unparalleled convenience. This machine comes with a built-in grinder with 13 settings. Seriously, with 13, you can get any grind you can possibly imagine. It is good to use for experiments. Up till now, the super automatics that we introduced requires to a certain extent some effort to make milk based coffee drinks. This, however, is truly super-automatic. You can make Cappuccino, lattes and macchiato in a single touch. In addition to its pre-programmed drinks, you can make your own milk-based coffee with its “milk menu”. To use this machine, there is a rather steep learning curve. You will have to adjust the amount of coffee, water, temperature and whole lot of other settings to make your first cup of coffee. Delonghi makes this a little easier with instructional video on their website. However, do take note that you might need a transformer to use this machine if you are not in Japan. Having an espresso maker at home is truly a luxury and there is nothing quite like that first sip of golden brown crema over a perfectly brewed cup of espresso. Pulling the perfect shot requires accuracy and isn’t an easy job done by just any espresso maker. Out of the 5, I would choose the Breville for reasons that I stated above. I need one that is more hands-on. But if you are looking for a good mix of everything, start with the Delonghi Magnifica. It has most of the features a decent home barista machine needs without breaking your piggy bank.